As a custom design and build firm, we get to experience a magical transition with every job we work on. The magic happens when you employ a custom builder who takes pride in translating wants, goals, and dreams to function, beauty and delight. After 26 years of building custom outdoor spaces here in the Piedmont Triad, we’ve had many opportunities to watch homeowner wants and needs translated to the outdoor living space they’ve been dreaming of. Updating, changing or adding on to your outdoor living space can be a complicated process. There are many options in outdoor living, making it essential to really consider how you’re going to use the space, past challenges you’ve had and specific goals you are trying to meet. Whether you are considering a paver patio, low-maintenance deck, pergola, covered patio or a screened-in porch, we take pride in our ability to help you make the best decision for your family, home and budget. We have chosen 3 recent projects to share with you that represent the magical process from project goals & dreams to a finished functional and beautiful space that exceeded the homeowners’ expectations. 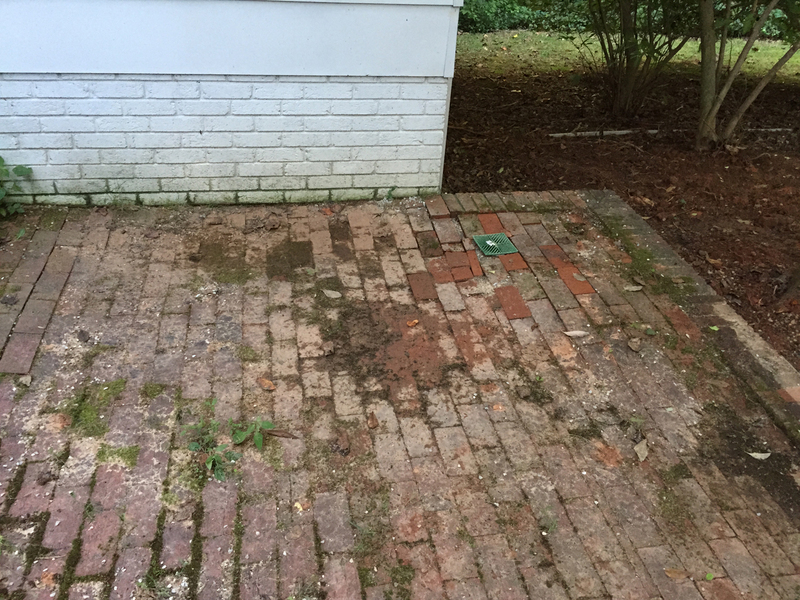 We recently worked with a Greensboro client who had an old brick patio that needed to be replaced. The home is an older brick ranch and the age of the patio was really showing. Being three steps down from the home, the patio was not draining properly. Also, with constant shade from the lovely mature trees in the yard, the water damage was really wreaking havoc on the once gorgeous brick patio. The homeowners called us to replace the old brick patio with a new paver patio, but we proposed a different solution. There was a free standing wood deck with a hot tub on it, unattached in the yard. We recommended one large pressure-treated wood deck. First things first, we put a drain in the existing patio, so we could build the new deck right over it and the water would drain properly away from the home. The design was for a single level, large wood deck that would house the hot tub as well as replacing the outdoor living space that had become unusable in recent years. For easier access and better aesthetics we created a beautiful multi-function outdoor living space on the same level as the home, The final result is a gorgeous pressure-treated wood deck with matching wood posts and railings built around the existing trees. We added a pergola for additional shade and a modern privacy wall for the spa area. With a parting board running down the middle we were able to create a gorgeous chevron look by running the deck boards in a mirroring diagonal pattern. We even built in a bench for additional seating under the pergola. 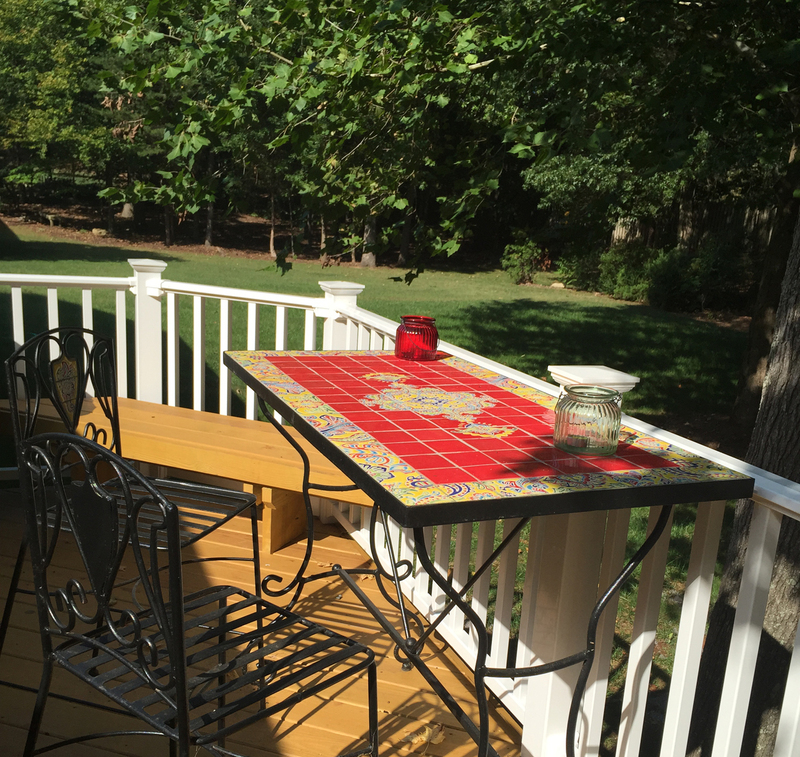 This Greensboro deck exceeded the family’s expectations as they were able to meet two outdoor living needs with one project. Our goal is to come up with luxurious outdoor living spaces you may not think of that include solutions you didn’t know were possible. When working with the best Greensboro deck builder, you’ll get more than just great craftsmanship, you get a full service design and build firm.